Although history only remembers the cosmonauts, space travel was made possible just because of researchers who first tested Soviet space technology. Fyodor Shkirenko was working during the years 1959-1961, at the time of preparations for “Flight 1”. 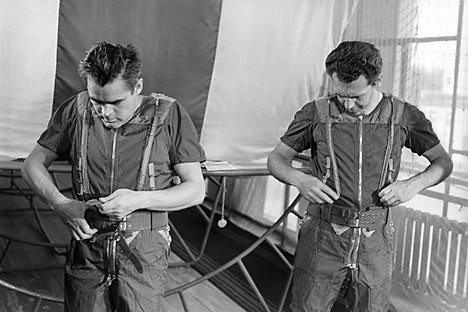 The majority of the tests were high–altitude survival tasks and psychological experiments. “We stayed in pairs during the compatibility tests; I stayed in an isolation chamber with a friend for a month, and then five of us were placed in a dark chamber. After a certain period of time, doctors asked each one of us what time it was. There was not a single lamp – just like in space. In this environment, we were rescued by communication… As for our guessing of time, it could differ up to few hours,” says Shkirenko. Gagarin and Titov - in fact all the cosmonauts in the first team - were very grateful to these educators, researchers, and ‘pre-cosmonauts,’ they came to speak at the Institute at the Dinamo metro station, where they trained, tutored and prepared the “brave young men” as Sergei Pavlovich Korolev called the space explorers. This is an abridged version of an article, first published in Russian by Vechernyaya Moskva.